Teacher preparation and professional development focus on a social justice perspective of education where thoughtful and reflective examination of teaching practices, structures and materials insure that they are accessible and meaningful for all learners from diverse linguistic and socio-cultural backgrounds as well as learners with diverse abilities and learning styles. Teacher preparation and professional development for PreK-3 educators blend sound elementary education teaching strategies focused on content knowledge with the child development pedagogies of early childhood education. 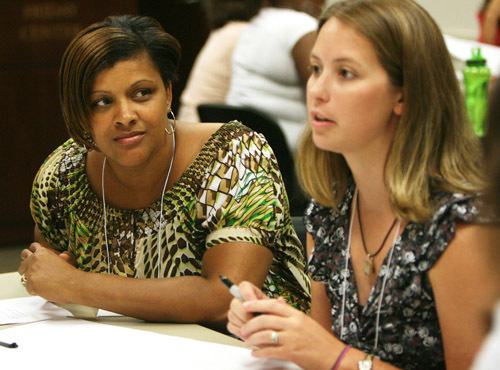 Educators are prepared to develop and engage in a professional learning community with their colleagues that welcomes an inquiry approach to teaching and learning, and supports effective use of data to guide instruction and monitor progress. The FirstSchool project is a program of the FPG Child Development Institute at The University of North Carolina at Chapel Hill.